STANFORD GRADUATE SCHOOL OF BUSINESS — He says he's never been camping or planted flowers and stopped mowing his own lawn long ago. But a self-proclaimed lack of "environmental credibility" hasn't stopped General Electric Chairman and CEO Jeff Immelt from striving to make his global company a power player in renewable energy, health care, and other important fields. 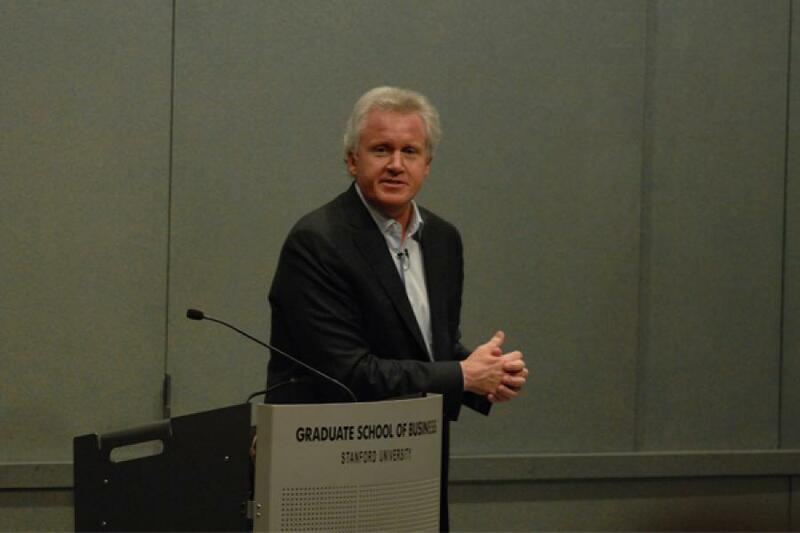 Immelt detailed the business changes he's seen, and revealed personal leadership challenges he has faced during nearly three decades at GE in a View from the Top speech at the Stanford Graduate School of Business on May 24. Immelt joined GE in 1982, the same year he earned an MBA from Harvard Business School. After starting off in the company's plastics business, he went to handle sales and marketing and eventually oversee half of the firm's U.S. sales force. But it was a phone call from Welch that solidified Immelt's professional destiny. Welch first detailed big trouble in the company's appliance business and then said he needed "a young talent, an outside set of eyes … somebody who's got the passion." Immelt accepted a three-year post in that division, a job that he called "brutal" and "tough." But it was also his break to prove himself able to successfully handle a huge role. Looking back, said Immelt, "I wouldn't be CEO today if he hadn't reached out and given me a high-risk, high-reward job." It's advice he follows himself. As an advisor to President Barack Obama's Economic Recovery Advisory Board, he's part of the independent group formed to advise the president on programs to help jump-start the economy. "I'm a Republican, but the president wanted to reach out and have different voices," Immelt said. "When I go and serve the president, my role is to say, 'Here's what I'd do if I were you.' To be a good friend in business, you better be able to see things with the other person’s point of view." Immelt's speech marked the final View from the Top event for the GSB's academic year and was dedicated to Roanak Desai, a second-year MBA student who died this spring after a short illness.